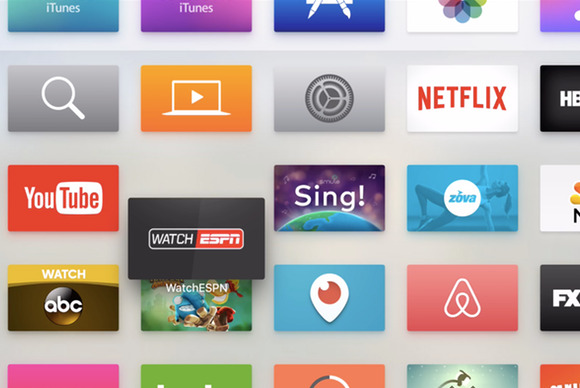 After installing your favorite streaming apps and playing some of the new games designed just for tvOS on your brand new Apple TV, you’re probably wondering what else this set-top box can do. 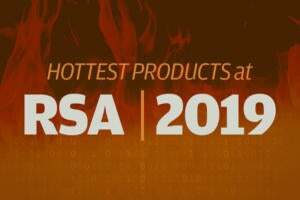 There are tons of under-the-radar features that let you customize your TV to your heart’s content, and make it much easier to use. 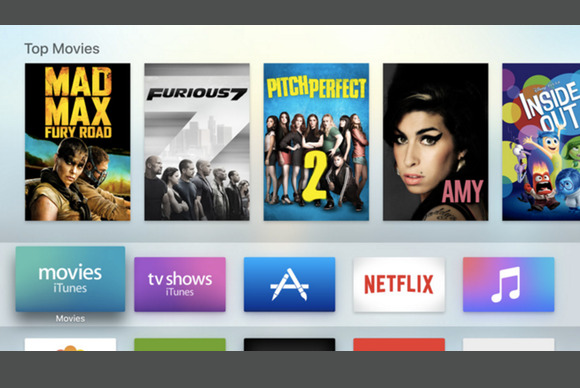 Here are 20 tips and tricks to make the most out of your brand new, fourth-generation Apple TV. Have any of your own to add? Share them in the comments. Searching for stuff to watch on your Apple TV just got a whole lot easier with the help of Siri. 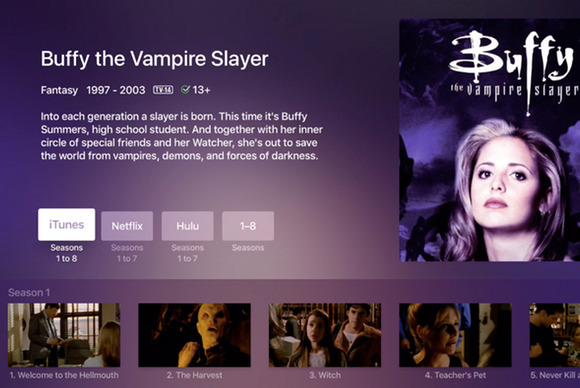 If you search for a movie or TV show from the home screen, Siri will search across several apps, including iTunes, Netflix, Hulu, Showtime, and HBO. If you open one of those apps and use voice search, Siri will show results just in that app. There are tons of tips and tricks to using the new Siri remote alone, so check out our entire list of Siri commands here and more touchpad remote shortcuts here. When you’re playing a video, a quick swipe down on the trackpad reveals some audio options. “Reduce Loud Sounds” will attempt to smooth out jarring changes in volume (handy for loud commercials in some TV streams), but Full Dynamic Range is the default. If the app you’re using supports closed captioning or foreign language subtitles, you can control that here. You can also select different speakers, which is great if you have a receiver or soundbar that supports AirPlay, or even paired Bluetooth headphones if you don’t want to wake the baby. 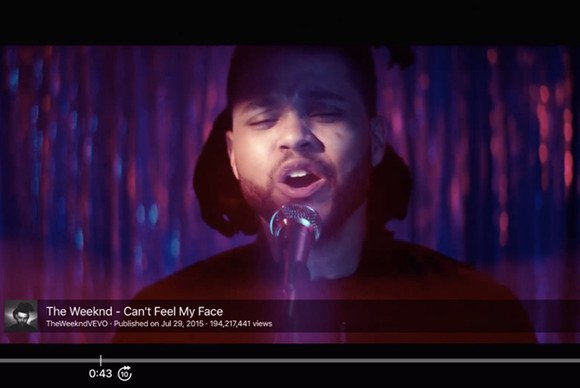 When you’re watching a show or movie in an app like Hulu or YouTube, you can swipe down for more options as it plays. 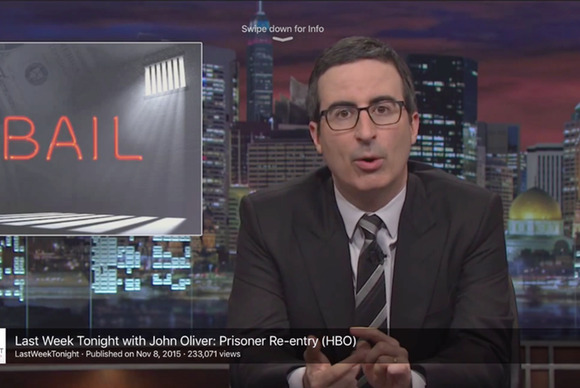 But if the “Swipe down for info” alert doesn’t disappear after a few seconds, which happened to Macworld’s Susie Ochs frequently in Hulu, either pause and restart the video to make it disappear, or press Menu to go back one level and then restart the video. 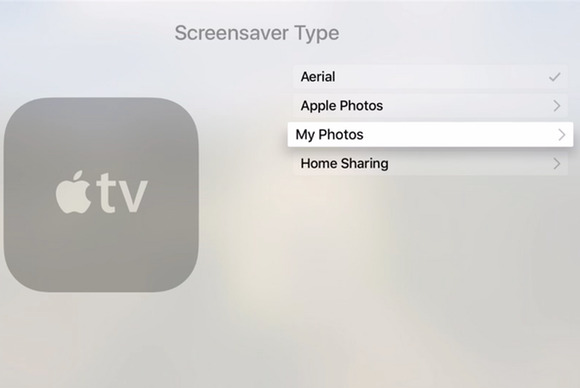 If you love the Aerial screensaver, head to Settings > General > Screensaver, and with Aerial selected in the Type field, you can change the Download New Videos field from Monthly to Weekly or even Daily. Just be aware new videos are downloaded in batches of about 600MB. You can’t customize which views you’re shown in Aerial, though—no restricting it to just your favorite city, for example. You can use your own photos as screensavers instead of the stunning aerial options Apple preloaded on the TV. Open the Photos app on your TV and then select an album you want to use as the screensaver carousel. Tap the screensaver option to set that album as your screensaver. 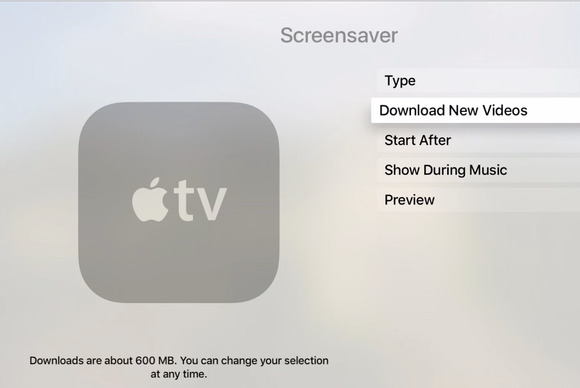 You can change up your screensaver at any time by going to Settings > General > Screensaver > Screensaver Type. 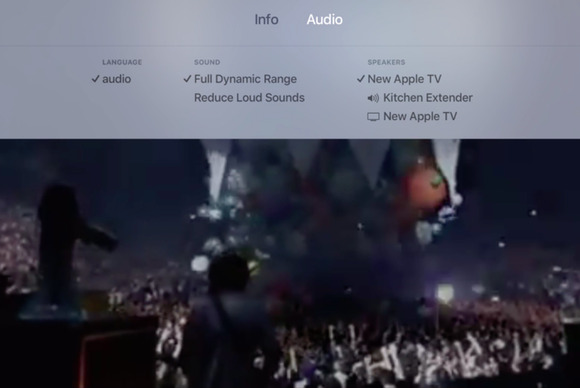 Apple Music subscribers can add to existing playlists or create new ones straight from the Apple TV. 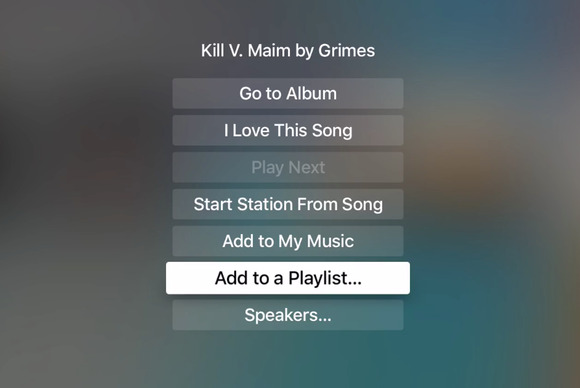 Pick a song to play, then use the touchpad to tap the More option (denoted with the ellipses) at the top of the Now Playing screen. Tap Add to Playlist and pick one to add to, or select “new” and give your playlist a name. If all goes well, iCloud Music Library will sync the playlist across all your devices. 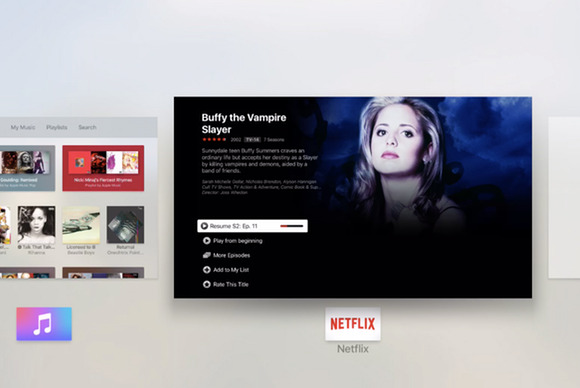 Apple TV has an app switcher of its own—just double-tap the home button. You can close apps by swiping up on the touchpad remote. 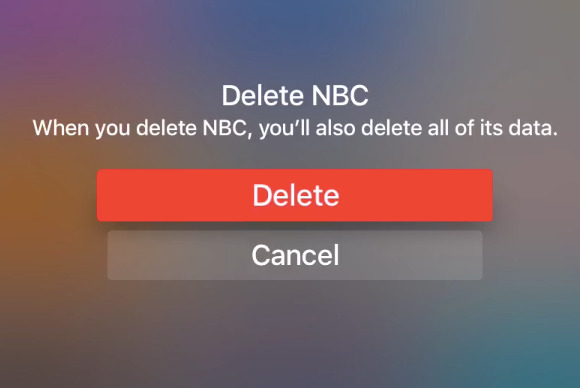 How to delete apps after installing them: Navigate over to the unwanted app and highlight it, then press down on the touch surface of your Siri remote until the app jiggles, just like it would on an iOS device. Press the play/pause button on the remote to delete it altogether. As on iOS devices, you can’t delete tvOS apps that shipped the device. 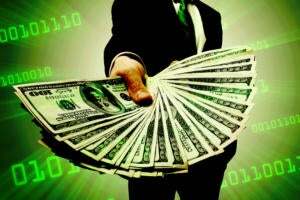 The new Apple TV comes with 32GB or 64GB of space, depending on how much you spend. If you’re an app-hoarder with a 32GB version, you’ll need to keep a close eye on how much room you have left by tapping through Settings > General > Manage storage. 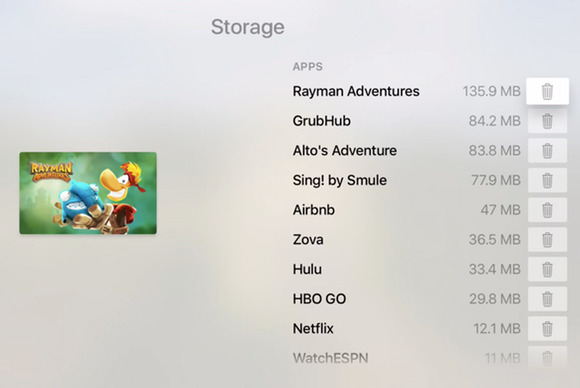 You’ll see a full list of apps stored on the TV and how much space they take up. You can delete the most egregious space-hogs by highlighting and tapping the trash can icon next to each app, or you can delete apps directly from the home screen. If you just want to move an app without deleting it, follow the same steps as you would to delete it: Highlight it and press down on the touch surface to make the app jiggle. Instead of hitting the play/pause button, just use the touchpad to swipe side to side or up/down and move the app around. You can’t power down the new Apple TV, but you can put it to sleep. 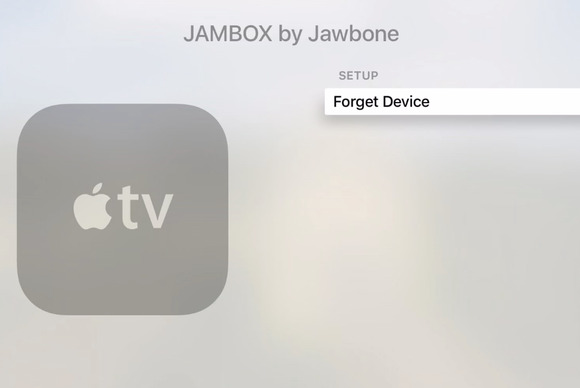 Just hold the home button, which will prompt the TV to ask if you also want to turn off devices connected to the TV—this means your television set. Press the home button once to turn it back on again. 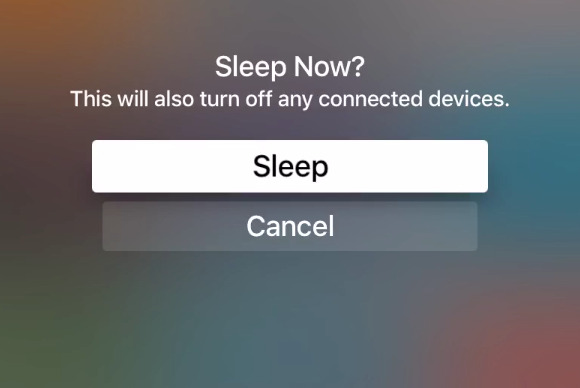 You can also put the TV in sleep mode by going to Settings > Sleep Now. 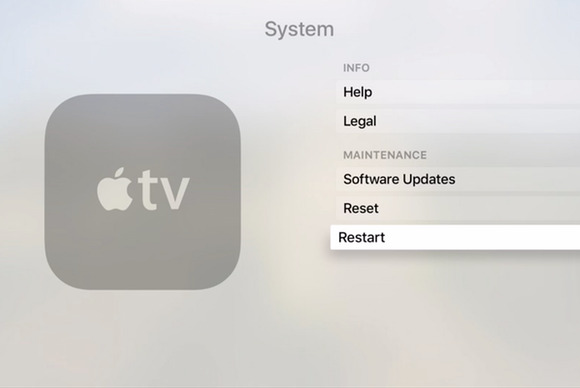 So you can’t turn off your Apple TV, but you can reboot it if you need to by tapping through Settings > System > Restart. If that doesn’t work for some reason, hold down the menu and home buttons on the Siri remote at the same time, then let them go when your display starts flashing. Multiple people can use the Apple TV in your house, and they don’t have to load up your account with their purchases if you don’t want them to. 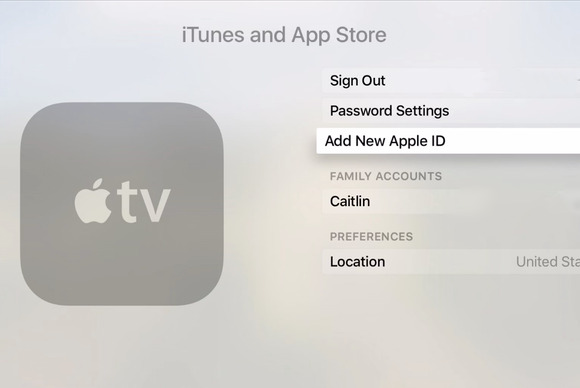 Associate multiple Apple IDs with your TV by adding a new Apple ID under Settings > Accounts > iTunes and App Store. After the new ID is added, your family members can switch to their accounts under Settings > Accounts > iTunes and App Store. If they install apps on the TV under their account, those apps will remain on your home screen. Siri can handle many of the little tasks you want to perform on your Apple TV, like fast-forwarding or rewinding content you’re watching. But you can also skip back and forth through a movie or show using the Siri remote: Press the right side of the touchpad to skip 10 seconds forward, and press the left side to skip back 10 seconds. You can only pair one Siri remote to a fourth-gen Apple TV, but you can pair two additional Bluetooth accessories: either two MFi Bluetooth game controllers, or one game controller and one Bluetooth audio accessory, like headphones or a speaker. Pair your accessories to the TV by tapping through Settings > Remotes and Devices > Bluetooth and selecting the device you want to pair. 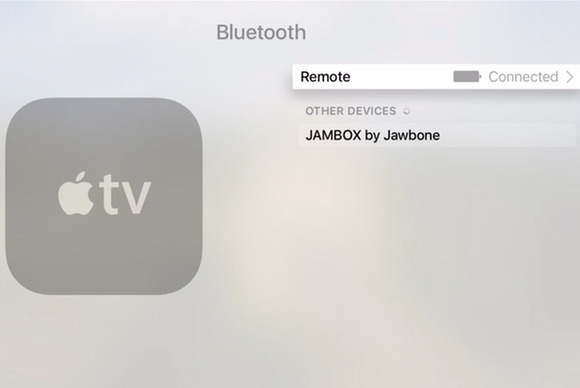 If you want to swap out one of your paired Bluetooth accessories for another one, just unpair one under Settings > Remotes and Devices > Bluetooth. Pick the accessory you’re done with, then select Forget Device. Turn your Siri remote into your main TV remote, or at least give it some extra functionality, by letting it control your TV power and volume. Let your Apple TV remote turn your TV on and off by tapping through Settings > Remotes and Devices > Turn On Your TV with Your Remote. 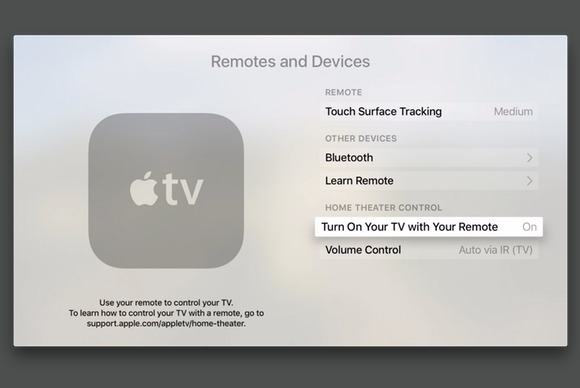 To enable your Apple TV remote to control your TV’s volume, select Settings > Remotes and Devices > Volume Control. 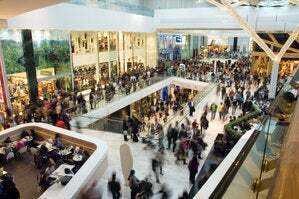 The Siri remote offers an accessibility assist for people with low or impaired vision. Ask Siri to turn VoiceOver on, or navigate to Settings > General > Accessibility > VoiceOver. As you highlight text with the touchpad remote, VoiceOver will read the text aloud. You can pause VoiceOver by tapping the touchpad once with two fingers. Tap twice with two fingers to resume VoiceOver. 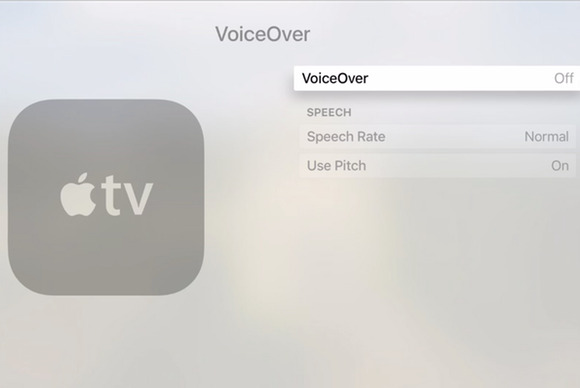 Check out more VoiceOver controls in Apple’s TV support documents here. There are a slew of other accessibility options supported by the Siri remote. 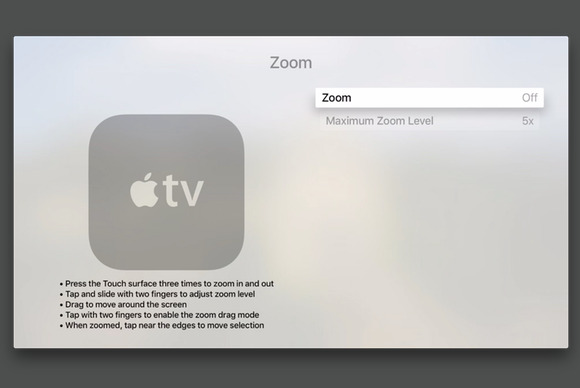 Turn on the Zoom feature in Settings > General > Accessibility > Zoom to use the remote’s touchpad to magnify Apple TV images, focus in on a particular area of the screen, pan across an image, or change the magnification of the screen. See all of the Zoom options here. 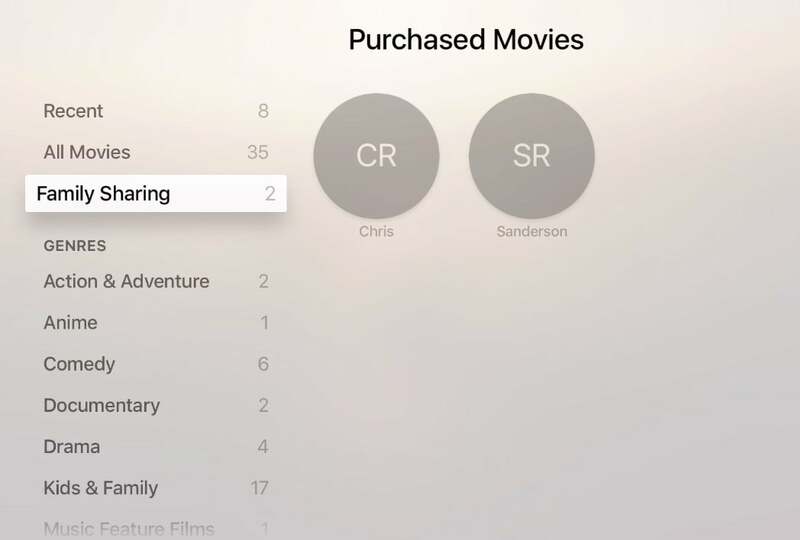 You can use Family Sharing on the Apple TV to watch movies or TV shows family members have purchased. Open iTunes, then select Purchased > Family Sharing and pick the name of family member from the menu bar. You have to use a Mac, iPhone, or iPad to set up Family Sharing before you get started on the TV.